After moving your worker(s), you activate the location where your workers moved to. The more workers you have at a location when it is activated, the better the reward; for example, you get 1/2/3 wood when you have 1/2/3 workers at the timber mill, 0/1/2 gold when you have 1/2/3 workers at the gold mine. Some locations require more than just workers too, i.e. you need resources as well as workers to be able to purchase some decoration tiles, and sometimes you need decoration tiles to be able to construct some palace tiles. The main goal is to construct the palace which is built by placing tiles together to create it as this scores VPs. 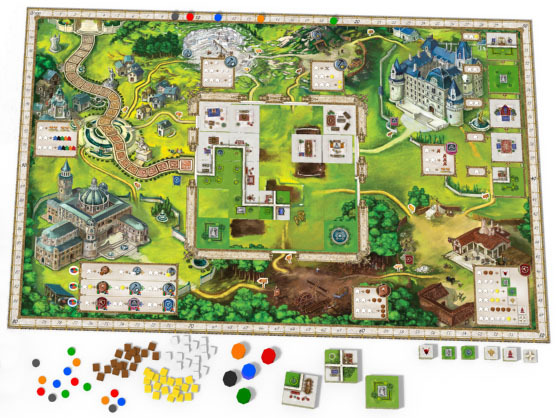 Players gain palace tiles from the Architect location (costing 1 or 2 workers and maybe gold) and use the Construction Yard location to place tiles they have so they fill-in the empty palace areas – much the same as how the tiles fit together in Carcassonne by matching internal/external sections on a new tile with internal/external sections of already placed tiles. The cost of placing a tile is shown on the tile itself (costing workers, cash, resources, and/or decorations) so a player knows how much it will cost to place it and what mix of internal/external sections it has on it when they purchase the tile. The technology track is interesting (reminding me a little of the technology tracks in T’zolkin). When a player lands on the technology construction location, they can advance their markers along the 3 tech tracks (by paying workers and resources). These look very useful as one track allows you to gain extra resources when you gather some, and the other two let you activate your workers in some locations when another player activates them. The King’s Favour construction location allows you to refresh your double movement tiles (or buy 1 of your 2 additional workers). The King moves along a track of his own and advances one space each time a player reaches (or passes) the King’s Favour construction location. The game ends either when the King reaches the end of his track, the palace is complete, or there are too few tiles left for purchase. Players score some extra VPs for items they have remaining at the end too. 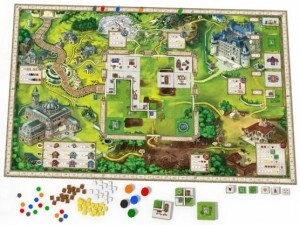 Versailles looks like it has lots of great eurogame mechanics within it. The movement of the workers means you’ll need to think about the order in which you move your workers, plus do you spread them out around the board so you have options, or clump them together so you can get greater benefits at a location. There’s some resource management too, plus using the advantages from the technology tracks looks important to really maximise your activities. I’m sure you will also want to factor in not activating locations where other players will use their technologies so they can activate them too. Purchasing palace tiles looks interesting as there are 5 face-up tiles but the more recently added ones cost more workers/resources. Bought tiles do not get replaced until after your turn; however, you can use workers to remove some tiles, slide the remaining tiles down (making them cheaper) and draw new ones to fill-in the spaces – so there is a way to reveal new tiles on your turn. As I mentioned, placing palace tiles is a bit like Carcassonne so not only will you need to urchase tiles you can afford but also tiles you will be able to place (and even then you’ll need to place them before another player places tiles that get in your way). It may also be possible to place tiles so they get in the way of other players, which adds some denial gameplay. 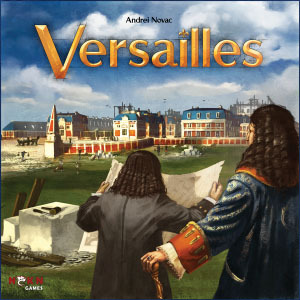 This entry was posted on Sunday, October 12th, 2014 at 11:46 am	and is filed under Board Games, Essen Spiel 14, Preview, Spiel 2014, Versailles. You can follow any responses to this entry through the RSS 2.0 feed. You can leave a response, or trackback from your own site.